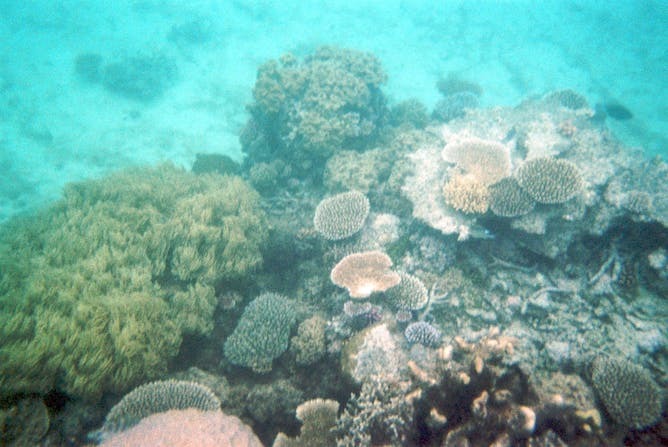 Social media posts, such as this image uploaded to Flickr, can be repurposed for reef health monitoring. Social media platforms such as Twitter and Instagram could be a rich source of free information for scientists tasked with monitoring the health of coral reefs and other environmental assets, our new research suggests. Ecosystems are under pressure all over the world, and monitoring their health is crucial. But scientific monitoring is very expensive, requiring a great deal of expertise, sophisticated instruments, and detailed analysis, often in specialised laboratories. This expense – and the need to educate and engage the public – have helped to fuel the rise of citizen science, in which non-specialist members of the public help to make observations and compile data. Our research suggests that the wealth of information posted on social media could be tapped in a similar way. Think of it as citizen science by people who don’t even realise they’re citizen scientists. Read more: Feeling helpless about the Great Barrier Reef? Here’s one way you can help. Smartphones and mobile internet connections have made it much easier for citizens to help gather scientific information. Examples of environmental monitoring apps include WilddogScan, Marine Debris Tracker, OakMapper and Journey North, which monitors the movements of Monarch butterflies. Meanwhile, social media platforms such as Facebook, Twitter, Instagram and Flickr host vast amounts of information. While not posted explicitly for environmental monitoring, social media posts from a place like the Great Barrier Reef can contain useful information about the health (or otherwise) of the environment there. Picture of health? You can learn a lot from holiday snaps posted online. Twitter is a good resource for this type of “human sensing”, because data are freely available and the short posts are relatively easy to process. This approach could be particularly promising for popular places that are visited by many people. In our research project, we downloaded almost 300,000 tweets posted from the Great Barrier Reef between July 1, 2016 and March 17, 2017. After filtering for relevant keywords such as “fish”, “coral”, “turtle” or “bleach”, we cut this down to 13,344 potentially useful tweets. Some 61% of these tweets had geographic coordinates that allow spatial analysis. The heat map below shows the distribution of our tweets across the region. 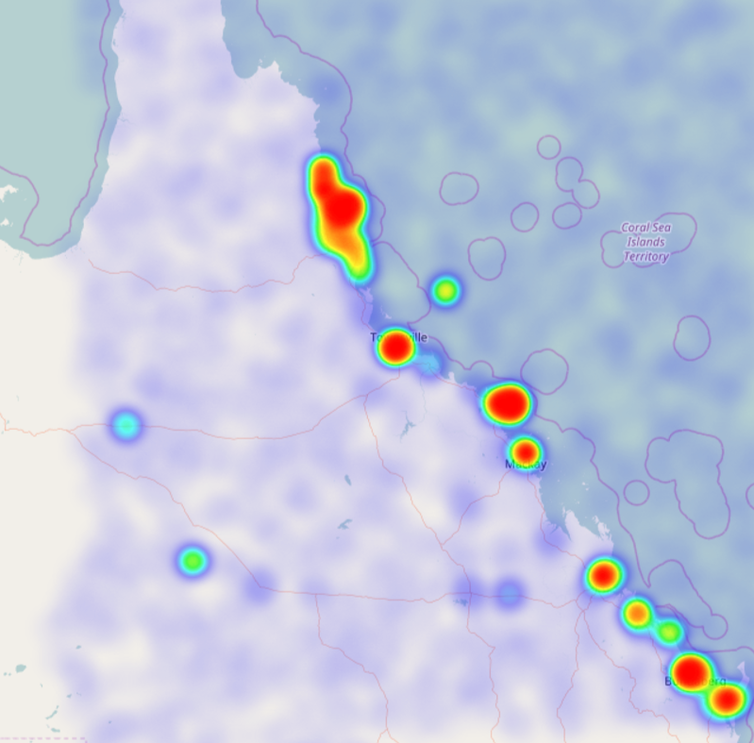 Tweet heat map for the Great Barrier Reef. Twitter is known as place for sharing instantaneous opinions, perceptions and experiences. It is therefore reasonable to assume that if someone posts a tweet about the Great Barrier Reef from Cairns they are talking about a nearby part of the reef, so we can use the tweet’s geocoordinates as indicators of the broad geographic area to which the post is referring. Images associated with such tweets would help to verify this assumption. Our analysis provides several interesting insights. First, keyword frequencies highlight what aspects of the Great Barrier Reef are most talked about, including activities such as diving (876 mentions of “dive” or “diving”, and 300 of “scuba”), features such as “beaches” (2,909 times), and favoured species such as “coral” (434) and “turtles” (378). The tweets also reveal what is not talked about. For example, the word “bleach” appeared in only 94 of our sampled tweets. Furthermore, our results highlighted what aspects of the Great Barrier Reef people are most happy with, for example sailing and snorkelling, and which elements had negative connotations (such as the number of tweets expressing concern about dugong populations). Clearly, this pool of data was large enough to undertake some interesting analysis. But generally speaking, the findings are more reflective of people’s experiences than of specific aspects of the environment’s health. The quality of tweet information with regard to relevant incidents or changes could, however, be improved over time, for example with the help of a designated hashtag system that invites people to post their specific observations. 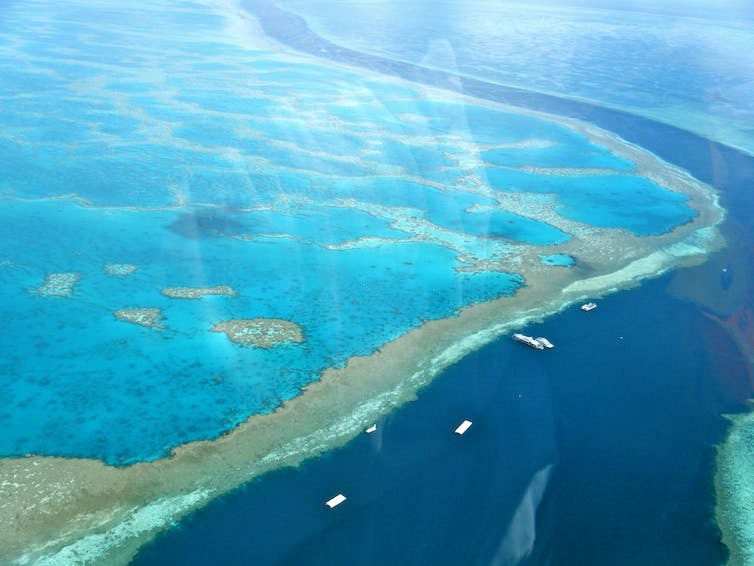 Read more: Survey: two-thirds of Great Barrier Reef tourists want to ‘see it before it’s gone’. Similar alert systems and hashtags have been developed for extreme events and emergency situations, for example by the New South Wales Fire Service. Tweets also often contain photographs – as do Instagram and Flickr posts – which can carry useful information. An image-based system, particularly in cases where photos carry time and location stamps, would help to address the lack of expertise of the person posting the image, because scientists can analyse and interpret the raw images themselves. The Great Barrier Reef is, of course, already extensively monitored. But social media monitoring could be particularly beneficial in countries where more professional monitoring is unaffordable. Popular destinations in the Pacific or Southeast Asia, for example, could tap into social media to establish systems that simultaneously track visitors’ experiences as well as the health of the environment. While it is early days and more proof-of-concept research is needed, the technological possibilities of Big Data, machine learning and Artificial Intelligence will almost certainly make socially shared content a useful data source for a wide range of environmental monitoring in the future. I have a Twitter newspaper that has been going for quite a while now. The newspaper publishes all the articles posted in my Twitter news feed and updates automatically. This particular newspaper follows my WildernessKev Twitter account, which contains news articles relevant to this Blog, the Kevin’s Wilderness Journeys website and various other articles posted by those I follow – environmentalist sites, conservation sites, etc.